Ph.D in Music Theory and Composition, Eastman School of Music. Over 200 compositions and arrangements in print, including works for strings, chorus, voice, piano and orchestra. Over 120 performances of his choral and organ works on the Mormon Tabernacle Choir's weekly broadcasts since 1975. 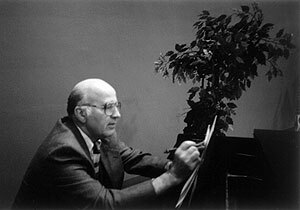 Over 30 commercial recordings of his works by other artists are available, including three by the Mormon Tabernacle Choir. Composer and arranger for all music in the Rainbow Tones String Series. • To preserve the integrity and traditions of classicism in string pedagogy, in a format that will encompass current and future technologies. • To create a correct foundation for young beginners, with respect for the child’s developmental level and individuality. • To provide qualified instruction for intermediate and advanced students, utilizing the texts, methods and other materials which have consistently been proven effective. These objectives can be met through. . .
• The creation of performance opportunities for students on all levels, from local concerts to international tours, including benefit performances for worthwhile charities. • Teacher-training workshops and master classes, to enable qualified musicians to develop, refine and expound the art of teaching. • Ongoing symposia and publishing opportunities for composers of original string music. • A scholarship fund for students with financial limitations. • Upholding humanitarianism and personal integrity as the cornerstones of artistic expression.